Founded in 1996, the industrial band Imperative Reaction built itself up from grassroots to one of the better-known, bigger-name industrial shows in the States. It’s easy to understand why: As a whole the band projected a genuine, honest enthusiasm for their work, shouting along with songs even when they weren’t within range of microphones—and this enthusiasm encouraged Pittsburgh’s notoriously standoffish crowd to push forward and start moving. Midway through the set, Ted Phelps—the frontman and remaining original member—told us we were the first group to have the balls to sing along with the new material. 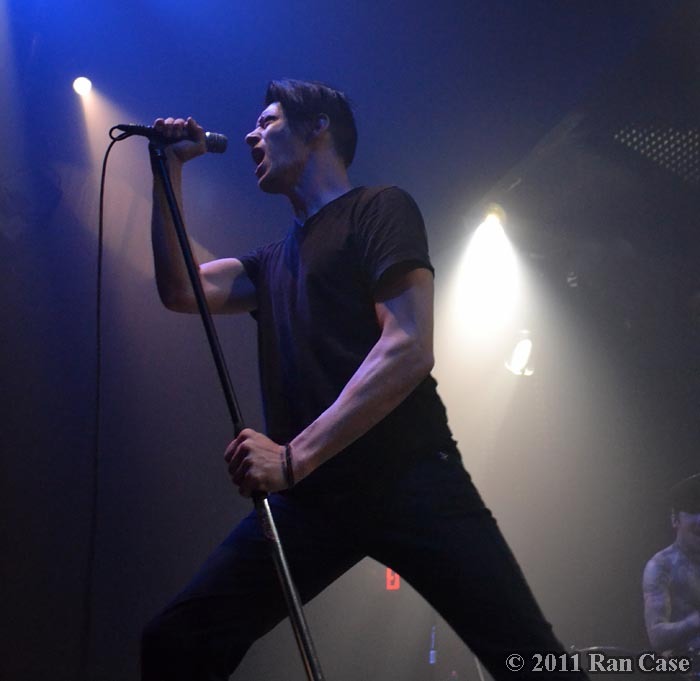 His voice sounds a bit like Davey Havok of AFI/Blaqk Audio with a bit of a rasp, and lucky for me, he was able to take a few minutes during the mess and chaos of preparing for the show to sit down and answer some questions. In regards to your new, self-titled CD: I saw a quote from you saying this was definitive of what you do as well as breaking new ground. Would you like to elaborate on that? I think that with this album it pretty much sums up our career so far, sound-wise and everything. You can definitely tell it’s us, but it’s also kind of going off in a different direction. It’s definitely different from the last one, which I wanted to do—I wanted to get as far away from the last one as possible. So we added some guitars, and some more rock-like drums. I think that gives it a little bit of a different direction. Also, I hired an outside producer this time, Krischan from Rotersand, and I’m really happy with what he did. It’s a big step forward for us. How’s the fan response been to it so far? It’s been amazing. I’m really happy with it, across the board: reviews, fan response has been really nice. I’m happy. This is the awful question: what do you feel then is the current direction of the industrial scene, and how you are contributing to or combating that? I think we’re contributing pretty much what we’ve always contributed, which is just kind of trying to forge our own path. There are points on this album where I would say we’re getting away from what’s popular in industrial right now, and that’s fine. I look at us more as an electronic rock band at this point, even though we’re obviously still rooted in the industrial scene and I don’t see that changing. I’m less concerned with what’s popular in the industrial scene at this point as it relates to my music. With how you said you consider yourself more electronic rock: Are you feeling out different influences through the new works? Yeah, I’m just working with what I like and I tried to push my voice more than I did on the last one, and work in something I haven’t worked in before: along with my original influences—Nine Inch Nails, Depeche Mode, the Cure—I’ve been working in some AFI or something like that, something far enough removed from the scene that it gives it a new spin on things. My tastes are very across the board, and I don’t want to spend as much time as I spend on an album, and as much effort, to sound like anybody else. To me it’s always been more important to define my own sound than to either copy what’s popular or go out of my way to be quote-unquote innovative. So no dubstep for you? Actually, I have to say . . . I’m surprised so many people in the scene seem to hate dubstep as much as they do. Personally, I like some dubstep—I don’t see a problem with it, and it’s funny to me when you’ve got a scene of music that’s literally, boom-boom-boom-boom, and the people in that scene are making fun of music because it does . . . whatever it does. I, personally—if something’s cool, I like it, and I don’t care what it’s called. I’m pretty much open to anything. From that angle then . . . What are you listening to? My wife has been playing The Kills a lot, their new album, and I like that quite a bit. I’ve been listening to everything from Sarah McLachlan to Nine Inch Nails, and Necro Facility—I really really like their new one a lot, I think it’s amazing. I know there’s a number of other bands and projects you guys are collectively and singly involved in. How do you juggle this when it comes time for touring? It gets interesting. That’s why we start planning months in advance, because we have to make sure we have everybody available. It’s a process. As far as who’s in my band? Yeah—basically, we do share band members and I’m cool with them playing whatever bands they want to be in as long as they’re around when it’s time for us to do something. It really seems that industrial is a very incestuous genre. Do you think that’s to its benefit or its detriment? You know, when I first got into the scene there was the whole Wax Trax scene going on, with Al Jourgensen and Sascha from KMFDM and the guys from Thrill Kill Kult who always seemed to work together in some way. So I think it’s just today’s version of that; I don’t think it’s that much different now. And I think it helps, because it’s nice to have sort of a network of people you know and trust and can get along with, who you can call when it’s time to go on tour. And the most important question: In the event of a zombie apocalypse, what are your plans? My plans . . . I’d consult with Clint on that, because he’s more the zombie expert than I am. This obviously means I need to talk to Clint Carney again. Check out Imperative Reaction’s youtube playlist, or see all their releases over at amazon.com. More pics from the Tryptich tour! This entry was posted on Friday, March 9th, 2012 at 7:59 pm. 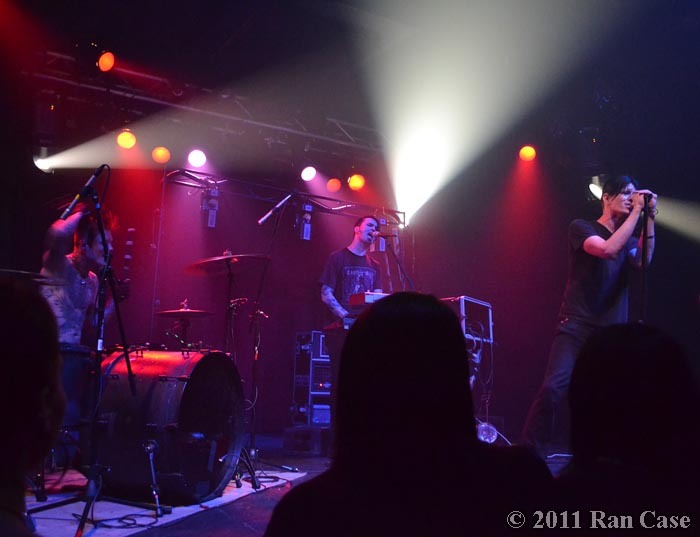 It is filed under Blog, Concert Photography, dubstep, Interviews, Music, Photos, Ran Case and tagged with band, concert, electronic saviors, Imperative Reaction, industrial, interview, live, music, Pittsburgh, show, tour. You can follow any responses to this entry through the RSS 2.0 feed.